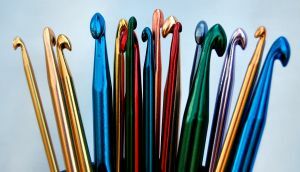 I haven't crochet in years, but I know my needles were the boring grey, not the bold colours of the hooks pictured here. Same with my ideas. Some become jewel coloured images moving together, developing into a story, but others are flat black and white stills. I usually still keep the idea as it may knit into one of the colourful scenes eventually. I like your analogy. Some ideas have more pizazz than others. I usually jot my ideas down on slips of paper or 3x5 cards. Sometimes I file them to refer to later when I need an idea for a column or story, but usually the ones I implement are fresh ideas that I received in the last day or two. Those shout to be written! It sounds like you have a good system. Do you ever go back to those items? I'm wondering if it's worthwhile to save every little idea. I guess they could serve as a writing prompt when we're stuck. Lots and lots of revisions. At least I have the general idea in my head, then I simply start filling sections out, plugging the gaps, and adding twists and turns in the plot. I'm like Jeanette. I too jot down ideas all over the place, but mostly in a little notebook that I carry around with me. Sometimes I go back to those ideas when I'm stuck. I know what you mean. You just described my process. Wouldn't it be nice if we could take a writing painkiller? LOL! There'd be a long line. I tend to write on little scraps of paper. Eventually, I corral them and stick them into a file folder. I used to have looseleaf paper to write on. Little ideas were shoved into that plastic wrapper the paper comes in. Now I put ideas in my blogging notebook. A great deal of them get used because I am always tring to get a topic of interest. In the old stort story days, there were many that did not get produced. There are so many snippets of life that I write down in the notebook I always keep in my purse. Unfortunately like the yarn in your closet, I sometimes don't go over those books for years. They sit there and collect dust while newer fresher images make their way to the page. If it's something I think I'll use right away, I keep it in the back of my mind for a spare moment between projects. Sometimes committing an idea to paper helps us remember. I know I'd lose an awful lot of material if I didn't write it down. In retrospect, I'm glad I keep a file. Then, I don't have to worry about missing out on a hidden gem. Idea to actual book is magical. Sometimes an idea won't leave me alone, so I have to do something with it. Love the crochet hooks. Good way to "hook" a reader with fond memories. I didn't know my first book idea WAS a book idea. Like you, it wouldn't leave me alone. You have blessed a very difficult season in my life, and I thank you. I thank God for the few minutes to check in on some special friends tonight--you're one of them.